This photo was taken on November 1, 2016 at 12:38 PM. 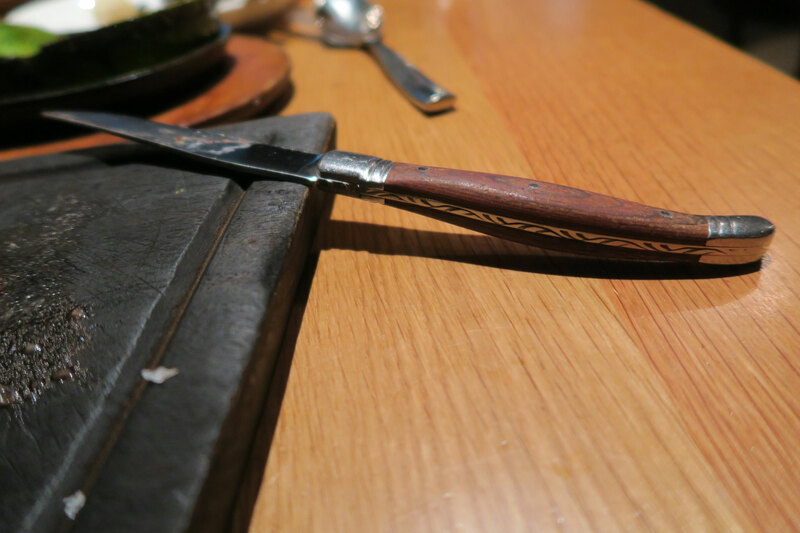 The location was in an upscale restaurant in Washington DC that featured Argentine cuisine. The "Take It!" came immediately when this side dish was placed in front of me, while having lunch at this restaurant. I had been coveting the potential to have a meal at this restaurant which is located in a hotel which I frequent on a reqular basis. I finally decided to just go ahead and take some time to enjoy a solo lunch there in order to savor not only the menu items but also the decor which is dedicated to the world famous Argentine cattle. The beef entree I chose was delicious and served on a section of seasoned wood with an ajus groove cut into it, cutting board style. They had already cut the meat in the final preparation from the kitchen after having gotten it off the grill. This seemingly little step was such a great thing to do. It eliminated a bit of effort by me (the diner) and thus enhanced the over all experience by quite a bit. 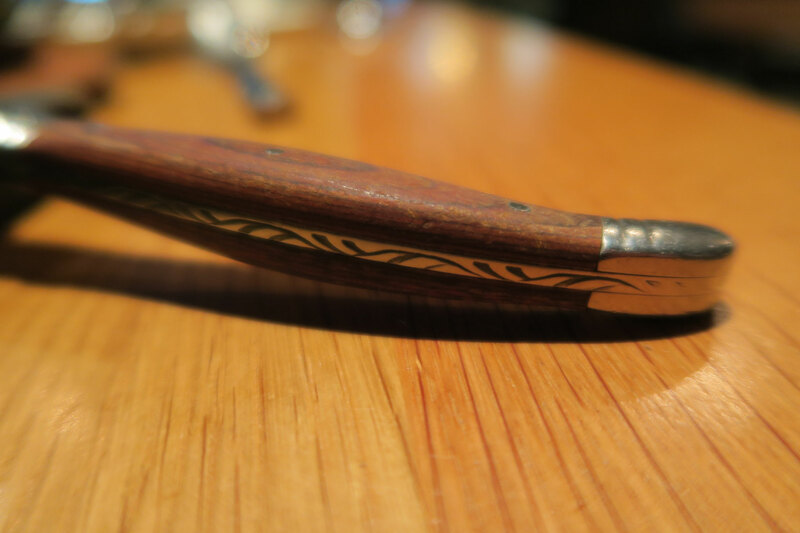 By the way, the steak knife was also very cool with its bit of ornate tooling to the exposed metal spine of the blade that went through the middle of the wooden handle. Enough about the beef, this is about the Avocado which was such an unexpected treat. 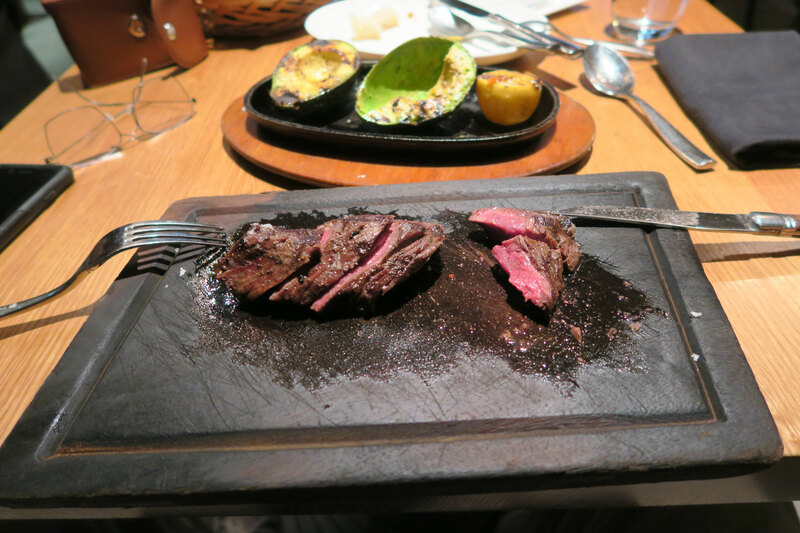 The pit had been taken out and the open halves of the avocado placed down upon an open flame grill. 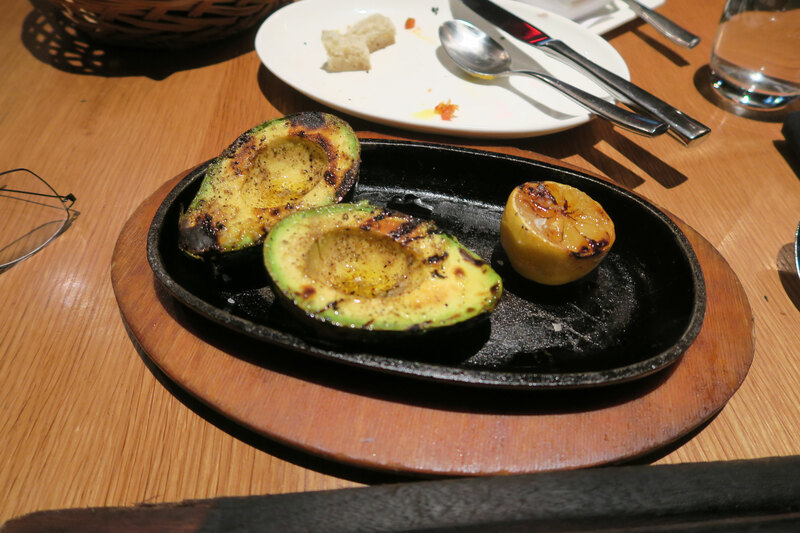 The avocado had previously been brushed with a butter based seasoning that added flavor as well as when exposed to the fire, some grill marks and contrasting color. It was served in the open halves with a half of a lemon that had also seen a short time on the open grill. The meat of the avocado was untouched. To eat it, I squeezed some lemon juice upon it and then cut groves into the meat, just deep enough to reach the inside of the shell. I then used a spoon to dig out the precut segments and include in the bowl of the spoon some of the lemon juice as a part of each mouth full. The new sensation of eating such whole avocado pieces as hot, was a pleasant sensation of its own. The After Take: I found the entire experience to be very pleasant and even avoided having dessert, or an after meal coffee, just in order to fully take in the entree experience and after taste, short term memory. After lunch, as the restaurant was then not crowded, I walked around and took a series of photos of the decor as found it to be quite different and appealing. The big reason for this photo/story entry is to share it, so that, for those of you that grill at home, to try this approach with an avocado. I hope you and maybe some guests will find it as enjoyable as I did. PS: Part of the fun of this site is that it gives me a chance to take you along with me. In many instances this premise helps to guide me as I position each photo shot. PSS: Just writing this, has me deciding to return as there were other menu Items I want to try and share with you. Whelp, now I'm hungry! Thanks! HA HA That looks fantastic and avocados and I have a very special relationship. I have a designer kitchen knife that looks JUST like that. Same design down the spine, same wood pattern, its gotta be the same brand. You had that steak cooked just right, I'm not big on avocado but man that steak looks great. I would love to know how it was prepared. I don't think I've ever had them cooked before.